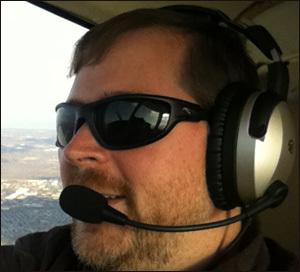 I recently had the opportunity to test a new take on aviation sunglasses. Flying Eyes have created a pair of sunglasses made specifically for pilots that solve the problems of the temple bar of the sunglasses breaking the seal of ANR headset and the pain associated with that bar. The Flying Eyes can be worn in two different states that I am calling "cockpit mode" and "gravity-enforced" mode. When in cockpit mode, you simply replace the temples with the adjustable webbing that can be tightened for a perfect fit, securing the sunglasses in place. The webbing passes seamlessly under the seal of your headset for a comfortable feel. Creator Dean Siracusa pointed out that, "If you're paying upwards of $1,000 for quality headsets, don't you want to ensure that you're getting the best performance out of them?" So why wear sunglasses the cause noise leaks? Although comfortable, in this state the sunglasses might earn you some odd looks when you are among your ground-dwelling friends. To combat this, simply replace the webbing with standard temples when you leave the airport, and you have an everyday pair of sunglasses. The lenses themselves are perfect for the cockpit. They are non-polarized lenses with UV400 sun protection and medium lense density that protect your eyes and ensure you can use your in-cockpit gadgets like the iPad and Glass panels with ease. Classify this product in the "why didn't I think of this?" category. After many hours in the cockpit and enduring the discomfort from wearing sunglasses with thick temples under a headset, Dean Siracusa, a pilot for 14 years, decided he might as well create a solution. Three years later he has a patent pending and has been selling his Flying Eyes since September. My only complaint was the first few times you make the transition the clips are very difficult to release. However, after a few transitions they work smoothly. I think Dean has a great thing going and his Flying Eyes now have a permanent spot in my flightbag. I just put new ear cup seals on my zulu's and the first use I heard a rush of air. I couldn't figure it out, I haven't experienced the problem before the new seals. I slipped my glasses off and the noise was gone. I now fly with the temple resting on top of the ear cups. I'm going to look into this product! !